DAYTONA BEACH, Fla. (March 23, 2019) – Brandon Robinson (No. 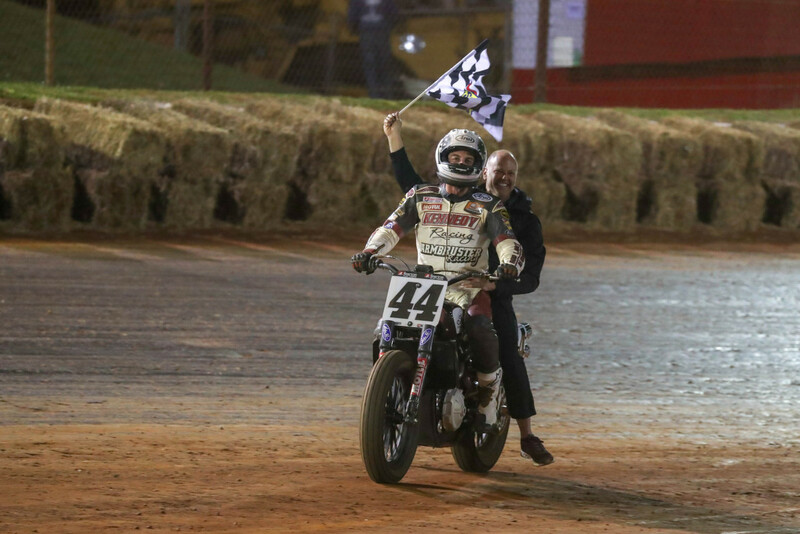 44 Kennedy Racing/Armbruster Racing Indian FTR750) accomplished what few riders have in recent American Flat Track history in Saturday night’s thrilling Yamaha Atlanta Short Track presented by Cycle Gear. On lap 22 of 25, Robinson made the race’s decisive maneuver, pulling off a skillful outside overtake to steal away the position. Mees had no response, as Robinson immediately dropped him en route to a 0.621-second margin of victory. Heading into the Main Event, DAYTONA TT winner Briar Bauman (No. 14 Indian Motorcycle/Progressive Insurance FTR750) appeared capable of carrying that season-opening momentum like a freight train. He ranked near the top of the charts all day and won his semi with relative ease. However, a difficult start in the Main threw him into a frenetic fight for position. At the end of the evening, he emerged on the podium with a hard-earned third after running as low as eighth early in the race. However, Bauman was never in contention for the win and finished nearly three seconds back of Robinson. Jarod Vanderkooi (No. 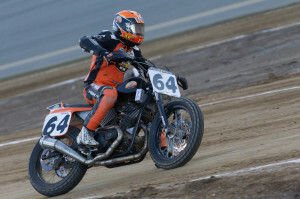 20 Harley-Davidson Factory Flat Track Team XG750R Rev X) pulled off a second consecutive charge up through the field to finish fourth, while ST master Henry Wiles (No. 17 Bandit Industries/DPC Racing/Wilco Racing Indian FTR750) completed the top five. Dalton Gauthier (No. 122 D&D Cycles/Gobert Smash Honda CRF450R) took the final step in completing a comeback story two years in the making. Returning to the scene of his last Roof Systems AFT Singles presented by Russ Brown Motorcycle Attorneys victory before being forced to serve a suspension for violating the sanctioning body’s substance abuse policy for the better part of the 2017 and 2018 seasons, Gauthier registered a towering victory in Saturday night’s 15-lap Main Event. Gauthier leapt out to the lead early and was never seriously challenged, upping his advantage to over a second before easing off slightly to secure the checkered flag. If the “Comeback Kid’s” runner-up result in the season-opening DAYTONA TT didn’t serve as warning enough to the AFT Singles field for what they were up against in his return, they understand now. If anyone had any hope of beating Gauthier on this night, it was Morgen Mischler (No. 69 Waters Autobody Racing/D&D Powersports KTM 450 SX-F). That is until he was swamped leaving the line and found himself buried in the pack as they stormed into Turn 1. Mischler was in astonishing form from there, making quick work of some of the best flat trackers on the planet to slash his way up to second. However, running down Gauthier was simply too big of a task. The last rider Mischler made his way past on his way to second was reigning AFT Singles champion Dan Bromley (No. 1 Red Bull KTM Factory Racing 450 SX-F). Bromley just continued to do what he does -- collecting yet another podium result to put toward his title defense. After earning last year’s crown on the strength of 13 podiums in 18 races, Bromley is now two for two in 2019. Ryan Wells (No. 94 Estensen Racing Yamaha YZ450F), who originally finished fourth, was disqualified for exceeding the maximum allowable weight for a rear wheel assembly following post-race technical inspection. Roof Systems teammates Oliver Brindley (No. 24 Roof Systems of Dallas/Fox Solutions Yamaha YZ450F) and Kevin Stollings (No. 99 Roof Systems of Dallas/Hinson Honda CRF450R) round out the top five for the Roof Systems AFT Singles class. The Yamaha Atlanta Short Track presented by Cycle Gear will debut on NBCSN Sunday, March 31, at 4:30 p.m. ET/1:30 p.m. PT and will re-air on Wednesday, April 3, at 3:00 p.m. ET/12:00 p.m. PT. Be sure to tune into the feature telecast of the DAYTONA TT presented by Russ Brown Motorcycle Attorneys tomorrow at 4:00 p.m. ET/1:00 p.m. PT on NBCSN. 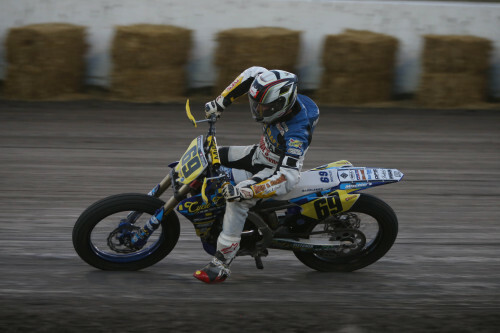 American Flat Track will take a few weeks off before returning to action for the Texas Half-Mile presented by Russ Brown Motorcycle Attorneys at Texas Motor Speedway in Fort Worth, Texas, on Saturday, April 20. As always, live coverage will be available at FansChoice.tv. 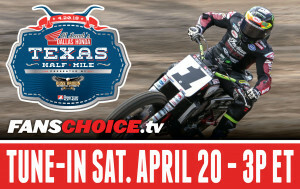 Tickets for the Texas Half-Mile are on sale now and can be purchased at www.americanflattrack.com.